There’s a reason why you’ll often find that push-ups are part of a structured fitness plan, and that’s because the push-up is a purely bodyweight movement that is both functional and incredibly valuable for building your overall strength. There’s no equipment needed, and you can do push-ups just about anywhere. 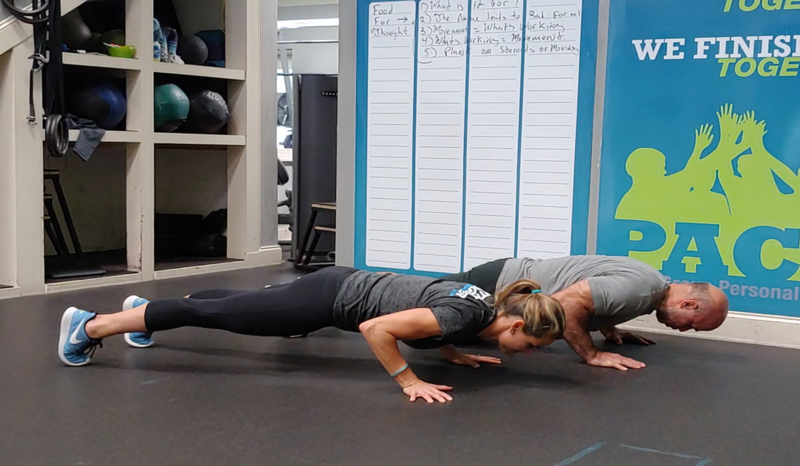 We spoke to Chavanne Scott, long-time personal trainer and owner of a top-performing Fitness Together studio in Charlotte, North Carolina, all about one of her favorite exercises: the push-up. According to Scott, push-ups are not just about the upper-body at all. In fact, when you properly engage all of the muscles needed to do a correct push-up, you’ll be working the back muscles, shoulder stabilizers, the glutes and the core as well. That’s a full-body workout with just one move. What are some of the most common mistakes you see people making with push-ups? Scott says that alignment and positioning are both essential with push-ups. She often sees people letting their head hang down during the push-up or letting their lower back arch, when actually the body — from the top of the head to the feet — should be in one long line. In addition to that, she sees people with their hands positioned either too close together or with their fingers too close together, when in fact a slight turn-out of the hands with the fingers spread firmly provides a better pushing position to fully open the chest. Place your forearms on the ground under the shoulders, place your toes on the ground and bring the body up into a forearm plank hold, with legs extended. In this position, your core should be tight and head in alignment with the rest of the body from the side view. Work up to holding this position with good form for a full minute to focus on building core strength and shoulder strength. Place your hands on the ground with the palms about a shoulder-width apart, fingers spread and pushing into the ground. Place your toes on the ground, bring the body up with the legs extended into a high plank hold. The top of your head should be level with your shoulders from the side view. Work up to holding this position with good form for a full minute to focus on building core strength and external rotation in the shoulders. Maintaining the same great position from the high plank, bend your knees and place them on the floor. Lean your bodyweight slightly forward over your arms and keep your hips down to create a diagonal line with the back. Bend your elbows and lower your chest toward to the floor, stopping when your elbows hit shoulder height. Push through your fingers and palms to extend the arms and bring the body back to the set position. Repeat for 10 to 12 repetitions. Set up in the same great position from the high plank. Begin to bend your elbows just a few inches and drop your chest down to a half-range push-up. Hold at this point for 10 seconds, then slowly let your entire body drop to the floor with your belly resting on the floor. Set back up in the beginning position and repeat this move for 10 to 12 repetitions. Try doing this set of exercises once or twice a week to build up the form and strength to conquer full-range toe push-ups — one of the most valuable full-body equipment-free exercises you can do.